After 100 years in business, Mossberg has grown to be the sixth largest U.S. firearms manufacturer, and remains dedicated to innovation, with over 100 design and utility patents to its credit. The MC1sc reflects three years of development and new patent-pending ideas in combining the most highly-desired features in the subcompact market with Mossberg’s innovative approach to design. Importantfeatures in a subcompact handgun are size, weight,caliber and carryability; and the MC1sc delivers with its overall length of 6.45 inches; recoil-managing weight of 19 ounces (with empty magazine); and barrel length of 3.4 inches in the popular 9mm chambering. Other desired features include two single-stack magazines, a flush 6-round and 7-round extended; glass-reinforced polymer frame; and suggested retail price of $421 for the two standard models. Innovation is what sets this subcompact apart from the competition. The MC1sc features Mossberg’s Clear-Count™ single-stack magazines. Constructed of a transparent, lubricious polymer compound, the magazines offer low friction and high wear-resistance, while providing quick at-a-glance assessment of the number and type of rounds loaded. The magazines also feature easy-to-remove floor plates and high-visibility followers. Each model comes with a flush 6-round and extended 7-round magazine. 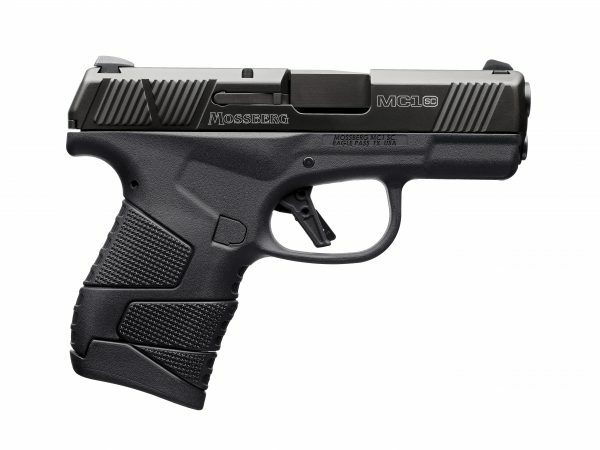 The MC1sc has the revolutionary, patent-pending Mossberg STS™ (Safe Takedown System), which unlike competitive products, does notrequire the user to pull the trigger to dissemble for routine cleaning or maintenance.Rounding out the innovative design is an aggressivepatent-pending Mossberg signature grip texturing, added palm swell and grip angle (similar to a 1911) for a more confident, firm grip. Standard features have not been overlooked in the design of the MC1sc. The slide is constructed of stainless steel with a DLC (Diamond Like Coating) finish, providing for reduction of slide friction and wear resistance. Aggressive, multi-angle serrations provide for ease of slide manipulation. And the slide is topped with dovetailed-mounted, low-profile white 3-Dot sights. The durable frame is constructed of a glass-reinforced polymer which provides high impact and chemical resistance with high tensile strength and stiffness. The barrel, constructed of stainless steel, also features a DLC coating and 1-in-16 twist rate. The MC1sc trigger has a flat profile and integrated blade safety; short, tactile reset; reduced overtravel; and has a five to six-pound pull weight. The smooth take-up combined with the flat trigger face offers an improved feel and clean, crisp trigger break. Trigger guards are also oversized for ease of access and comfort. All MC1sc models have a reversible magazine release, located behind the trigger guard, and there is also a frame variant with a reversible cross-bolt manual safety available. As a factory option, you can choose from MC1sc™ models with two sight systems. TRUGLO Tritium Pro Night Sights feature a FOCUS•LOCK ring for faster focus combined with a quick U-notch design providing outstanding sighting in low-light shooting conditions or complete darkness. The trigger-guard mounted Viridian E-Series Red Laser is specifically designed for the everyday conceal-and-carry owner, providing a powerful red laserfor rapid target acquisition. This entry was posted in Concealed Carry, Guns, Semi-Auto and tagged 9mm, introduction, mossberg, pistol. Bookmark the permalink.